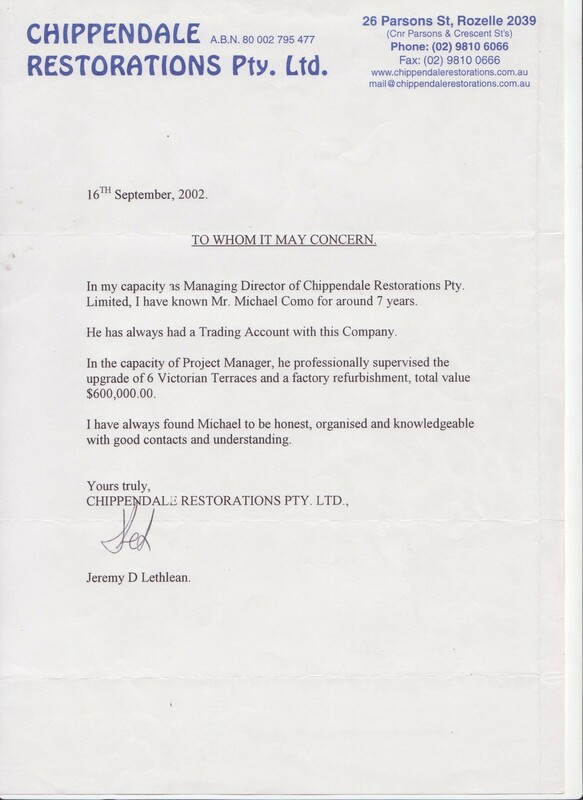 In my capacity as Managing Director of Chippendale Restorations Pty Ltd, I have know Michael for around 7 years. He has always had a trading account with this company. In the capacity of project manager, he professionally supervised the upgrade of 6 Victorian Terraces and a factory refurbishment, total value $600,000.00. I have always found Michael to be honest, organised and knowledgeable with good contacts and understanding. Thanks for forwarding the final tax invoice. $3,190.00 has been paid into your bank account today so it should be accessible immediately. I would like to thank you most sincerely for the great job which you did repairing the sagging floor in my unit. I can’t wait to get new carpet laid and – for the first time in many years – I’m not dreading the approach of winter winds!!! Your work was thoroughly professional – you were on time, tidy and certainly did “a good day’s work”. I would have no hesitation in recommending your services to others. 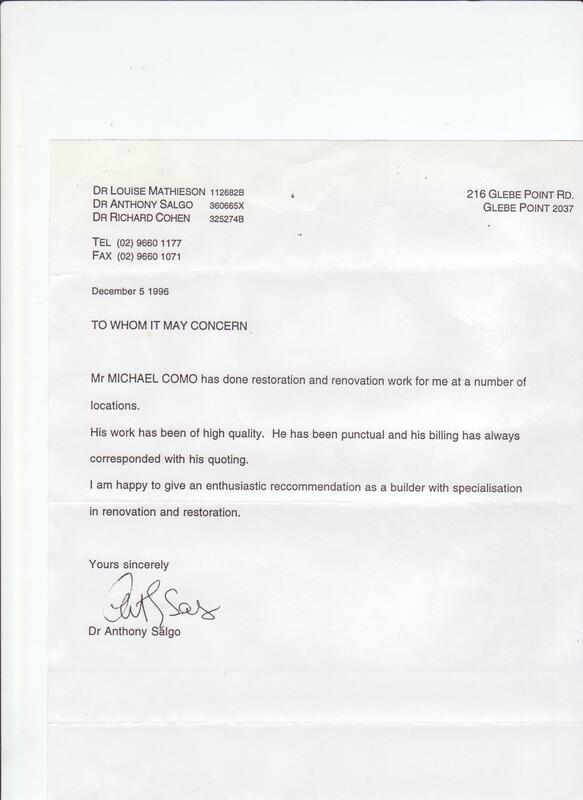 Mr Michael Como has done restoration and renovation work for me at a number of locations. His work has been of high quality. He has been punctual and his billing has always corresponded with his quoting. I am happy to give an enthusiastic recommendation as a builder with specialistion in renovation and restoration. I have known Michael Como for the past two and a half years. During this time he has been employed by us to do a variety of building jobs at the above address. The jobs have ranged from minor repairs through to structural work which involved the removal of part of a wall separating two rooms. Michael has been thorough in completing all these jobs and the level of workmanship in the finished product has been of the highest order. 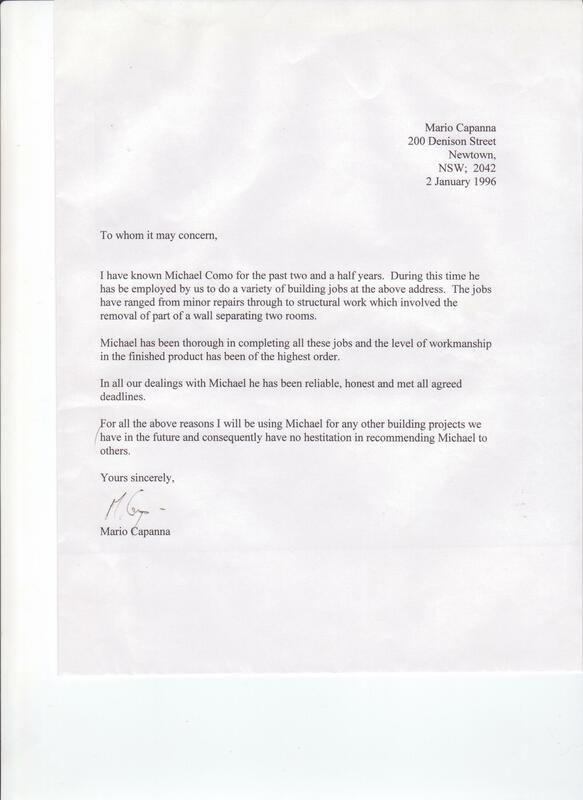 In all our dealings with Michael he has been reliable, honest and met all agreed deadlines. For all the bove reasons i will be using Michael for any ohter building projects we have in the future and consequently have no hesitation in recommending Michael to others.